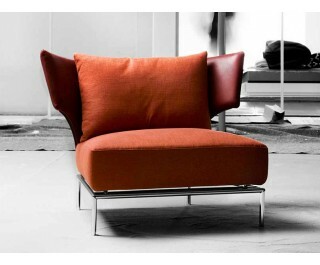 Little armchair, essential lines and a vague reference to the classical period. Metal frame, seat springing system with elastic webbing, padded with non-deformable polyurethane foam, polyester fiber and covered with 100% cotton-fabric filled with natural goose feather. Back metal frame reinforced with polyester cotton-fabric and covered with polyester fiber. Back is made of metal with galvanic treatment and satin matte chrome finish. Base in tubular steel with galvanic treatment bright chrome finish. Back cushion 100% cotton-fabric filled with piumafill: 50% natural goose feather, 50% polyester fiber. Covers can be made with fabric or leather.